Canadian National Rys. Canadian Pacific Ry. Trains will not required termina clearance passing from on Subdivision to another provided train oder signal idnicates proceed . Trains will not require terminal clearance passing from one Subdivision to another provided train order signal indicates proceed. Trains may leave Hamilton Jct. without registering or obtaining terminal clearance provided train order signal indicates proceed. Junction with Hamilton Sub. at Hamilton Jct.—Interlocked. Movements not authorized by time table or train order may be made in the direction of current of traffic between Hamilton Junction and Main Street on the time of superior trains in the same direction provided they are kept sufficiently clear of such trains to avoid delay. Westward trains may leave Hamilton Junction without obtaining terminal clearance, provided train order signal indicates proceed. Junction with C.N.R. and with Goderich Sub. at Hamilton Jct.—Interlocked. 1920-08 C.P.Ry. orders 48-lever Saxby & Farmer interlocking machine17 signal levers (4 dwarf, 5 call-on arms), 6 derail, 7 switch, 9 facing point locks from Union Switch & Signal for Hamilton Jct. News of the Month/Construction, Railway Signal Engineer, Vol. 13, No. 8 (August 1920), p. 348 . 1921-03 G.T.Ry. and C.P.Ry. authorized to operate trains over interlocking plant at Hamilton Jct. without first stopping B.R.C. 30769 . 1937-03-25 C.P.Ry. authorized to remove certain derails from Hamilton Jct. B.R.C. Order No. 54111 . Railway Signaling, Vol. 20, No. 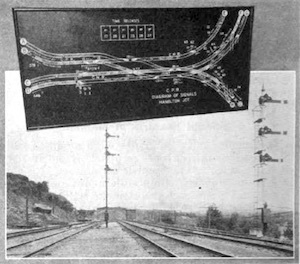 10, p. 374 Home signals at Hamilton Junction plant—Insert shows track diagram. Railway Signaling, Vol. 20, No. 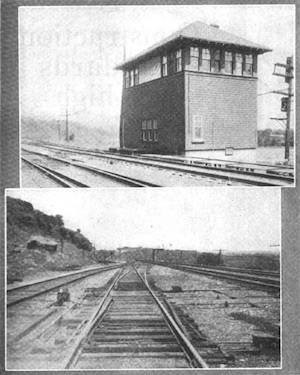 10, p. 375 Top—Hamilton Junction tower; Bottom—Dwarf signal, derail and bolt lock. Railway Signaling, Vol. 20, No. 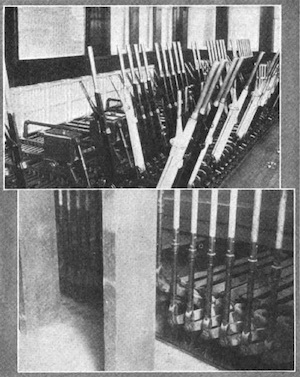 10, p. 375 Top—Second floor of tower—note bright finish of levers and locking bed; Bottom—Vertical rod connections to rocker shaft leadout on first floor.